For most of the 20th century Forrest, Il. was a well situated high activity level hub for the Wabash Rail Lines which later evolved as the Norfolk and Western Rail Lines. One of their main corridors extended from Chicago to Decatur and Forrest was conveniently located approximately half way between the two larger terminals making it the perfect spot for a considerable amount of freight traffic arrangements, car maintenance, and train supplies and communications. Those north and south lines also intersected the TP&W line that runs east and west through the town giving the Forrest hub access for the transfer of railroad cars from one line to the other. There was also a passenger train service that operated on the Wabash/N&W rails and Forrest was one of the local stops that many folks used. They could accomplish their travels to destinations all over the country through the passenger train network that their passage out of Forrest connected them to with the biggest attraction being to Union Station in Chicago. It was a thriving activity center for all sorts of railroad traffic and related business and recreational doings and the Depot was a 24/7 operation that was the controlling factor in making it all come together. In the same building was the Bluebird Café which offered meals to passengers and trainmen alike and just down the street was the Forrest Hotel (now the restored Hampsher Hotel) that was a long time place of convenient overnight comfort for so many in that atmosphere of hustle and bustle that seemed endless. The Norfolk & Western has now gone the way of so many of the old time rail lines, coming to rest in the memories and history of all the places it touched. Forrest, however, has a group of folks that are energetic, resourceful, inspired, and committed, and they are working hard to preserve that history in a physical sense. The Forrest Historical Society has launched a campaign to restore the Depot and put in a permanent pavilion and, if the budget can continue to gain momentum, possibly a walking trail, some swings, wagons, carts and other park style décor that will provide a total recreational package while putting the area’s history in physical tact. The depot building itself has had the conical peaked turret reconstructed in its roof configurement so that it now looks as it did prior to a fire back in the early 50’s and the care and quality of work that is being put into the restoration project will provide a low maintenance, well manicured and well lit original appearance with exhibits and artifacts from the time period on display. Their work, still in progress, also includes a miniature model display that will depict the buildings of Main Street and the track layout for the Wabash and TP&W yards as well as the nine bays and turntable of the locomotive Roundhouse with all of it reflecting the time era that it occupied. An assortment of model trains being provided by Jerry Roth, and also from the collection of Bill Miller, will be on display to complete the ensemble and bridge the gap going back to yesteryear. Complimenting all of this will be a large collection of TP&W history including information on every engine the lines bought. Their operational papers from the Commerce Commission when Franklin Roosevelt took the lines over and the transfer to the owners after him, the Crescent City disaster caused by the explosion of some tank cars, and original paper artifacts that bring the lines history to life. All in all, this project will ultimately become a valued museum with a park and recreational center that will bring the past into the present while providing a comfortable atmosphere for those who will be lucky enough to have the experience of seeing it. The Forrest Historical Society has done a lot of great work in getting the project underway using diligent research, local knowledge, and a whole lot of well-placed energy. A lot of the local folks with roots in Forrest have pitched in with artifact donations, ideas, help, financial contributions, and solid support for this valuable effort. Jim Gulliford has led a group of locals that have provided a nice assortment of unique items that will add original credentials to the artifacts going on display – Jim has family ties to the Wabash/N&W which makes them part of the history as well. 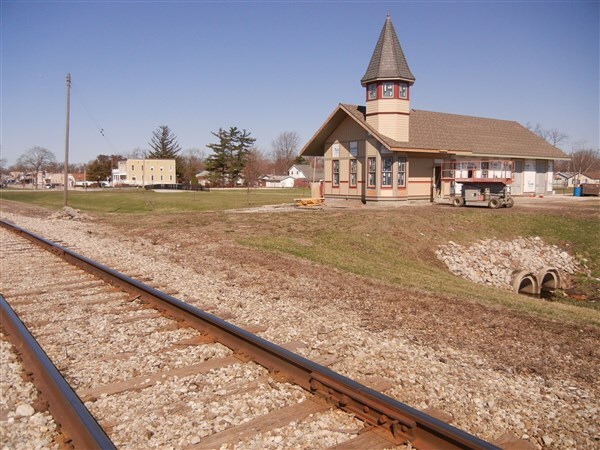 The beginning of the project was made possible by a sizable contribution from the Prairie Lands Foundation which made it plausible for the Village of Forrest to obtain the property from the railroad and Prairie Lands has continued to support the ongoing project. A big tip of the appreciation hat goes to them for all they’ve done and continue to do. There have been numerous contributions involving resources, time and expertise that have come from companies and individuals who are dedicated to the success of this endeavor and, needless to say, it couldn’t have reached fruition without them. There is still much to do with the hopes that the basic operational function can be achieved by the annual celebration of Wabash Days in September. The Historical Society is still in need of additional resources in order to make this historical monument into the showpiece it deserves to be and anyone who can help with that need is urged to call the Village of Forrest at (815) 657-8226 and they can fill you in on how best to accomplish that – all donations are important and much appreciated. So get ready to get your ticket to ride, back to the time when the Iron Horse ruled the rails and got things and people to where they needed to go. (Did you know that freight train conductors, standing on the steps of the caboose, used to snare messages from the depot with the crook of their arm from a Y shaped wooden extension that held the paper in a break away strung string as they went by at 30 to 40 mph?) When it’s ready you’ll be able to see the history from the rough and tumble years of yesterday in all its glory and dignity, so don’t miss it – All Aboard!